Destiny is a member and daughter of members of Ordo Pondera, an ancient Order dedicated to keeping the world in a state of balance. An Initiate in her Order, Destiny had control of the four elements, Fire, Water, Earth and Air and has learned several of the different ritual of her order. Destiny, unlike many in her Order believes in taking a more active role in the fight to keep the world in balance. While the rest of Order tends to work behind the scenes Destiny wanted to take a more active role. Despite her decision to act outside of the Order, Destiny still feels a deep connection to them and the Earth, which lead her to adopt the name Talamh (pronounced Tall-lom: the Irish Gaelic word for earth or land) as her hero name to acknowledge both her connection to the Earth and her respect for the origins of her Order which originated in ancient times in what is now know as the United Kingdom. Destiny was born and raised in Ireland until she was 14 when her parents were asked to go to America to aid the sect in New York City. 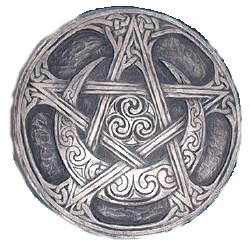 The Celtic Moon Pentacle serves as the symbolic representation of Ordo Pondera. It is the symbolic representation of the Earth in balance with all four elements. Oooo visuals Very neat character! Is it possible that the Order has contacts who know my character? She does do work with supernatural people.